Apple has finally jumped on the NFC train with the iPhone 6, iPhone 6 Plus and Apple Watch, but sadly you'll only be able to use it with Apple Pay, at least for the time being. NFC is used for all sorts of things, from contactless payments to easy pairing of devices - it can even be used to unlock doors - but it's only the contactless payments bit that you'll get from Apple. That means you won't be able to use it for contactless PayPal payments, for example. Or at least that's according to Cult of Mac, which claims to have got confirmation from an Apple spokesperson. It's not all bad news though, as we're likely to see Apple Pay supported in a lot of places, especially as the company has already partnered with Visa, MasterCard and American Express, and Apple is also going to allow developers to integrate Apple Pay into their apps. It's also possible that it might expand the functions of its NFC chip in future, much like it's now doing with Touch ID, but that's likely to be at least a year away. 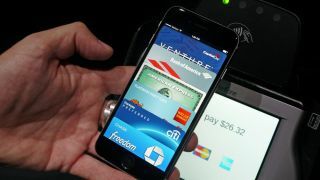 For now we're stuck with just Apple Pay, rather than the full features of NFC. Want to see what we think of Apple Pay?